Telephone is always best to reach Laura or June. We thoroughly enjoyed the tour and have marked it as the highlight of our trip to Charleston. We all were very impressed with your deep knowledge of Charleston’s history and its ties with major events that have unfolded to the present day. The walking part of the tour of the homes and gardens was beautiful; we could not have asked for a better guide (or weather)! The six “hat” ladies from Tennessee want to say thanks and let you know how much we enjoyed our Private Tea Party Tour, it was great, June was an excellent tour guide. We really enjoyed the breakfast buffet at the historic Palmer House overlooking the harbor, what a wonderful view. Afterwards as we headed out to discover beautiful private homes and lovely gardens, some owned by your personal friends, June amazed us with her knowledge of Charleston’s history, answering our many questions without hesitation. She was so accommodating, going that extra mile to ensure we got to visit as many places as possible. Even when we ask about visiting a church, she quickly arranged a visit to St. Michael’s. June was also very personable. It was an extremely hot day so she continually checked to see if we were comfortable walking a little further or needed water, a break, taking group photos, etc. The final stop at Sarah’s house for lunch was so nice. Please let Sarah know she was the perfect hostess, a true southern lady. This was a good time to relax and visit with our new friends, June and Sarah. I also have to mention the dessert, chocolate torte, it was fabulous! A good way to end a fun day. We will definitely recommend the tour to others. What a wonderful day we had with Ms. June as we toured downtown Charleston. We had the most delightful time, starting with breakfast on the Battery continuing as we walked through the historic streets of the city, ending with a delicious lunch at Ms. Laura’s home. This tour is a must for anyone visiting or living in Charleston. These two women pour their heart and soul into making Charleston come alive. Thank you for a day we will NEVER forget. My lucky son just got a new job in Charleston! So my husband, son and I decided to spend a gorgeous Friday morning with native Charlestonian, Laura Wichmann Hipp, touring “her” town. She is such a charming and gracious host, overflowing with love and historical knowledge of this enchanting city! Imagine enjoying a lowcountry breakfast buffet upstairs in the historic Palmer House on East Bay street overlooking the harbor and Ft. Sumter, and then heading out to discover beautiful private homes and lovely gardens, many owned by her personal friends. To top it all off, you are brought back to her family home downtown on Tradd Street to enjoy High Tea. 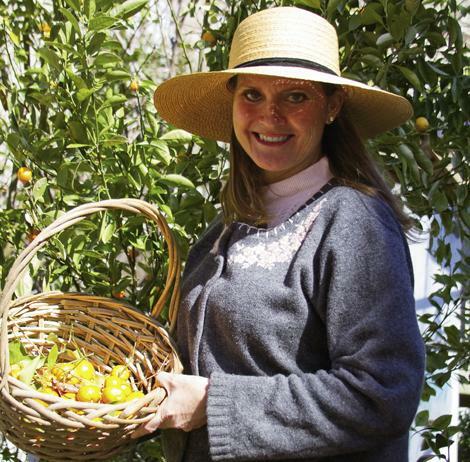 If you are lucky, you may get to enjoy her homemade Calamondin Marmalade or some other secret homemade treat from her garden! In the end, you feel as though you have not been on one of the numerous manufactured “rehearsed” tours, but rather, have spent time with a good friend in a city that she can’t wait to show off and share! We throughly enjoyed ourselves and highly recommend Laura’s intimate tour of Charleston. You will not be disappointed! Thanks so much for a wonderful time, Laura! I brought my Mom and her best friend on your tour last spring and we had the absolute best time!!! Your knowledge, charm and wit kept us begiled over Charleston’s history and architecture. Every step of the way you provided super information and certainly entertainment as to the “going’s on” that Charleston, behind the scenes, had enjoyed over the years. This tour with Mrs. Laura Wichmann Hipp was outstanding, I cant say enough about her and what she knows. I left feeling like it was such an honor to have met her and to have spent that much time enjoying all of Charleston. Thanks again to a lovely, lovely lady !!!!! This was THE best experience i have had there. Laura Wichmann Hipp is truly a Charleston treasure. We took her Charleston Tea Party Tour today and thoroughly enjoyed ourselves. This is not like any other tour I have taken…this is special. Laura graciously takes you into her home for a home-cooked lunch/Tea, after having escorted you through beautiful historic homes that are not normally open to the public. History is her passion, as well as insuring that her guests enjoy a unique and memorable experience. This has been the highlight of our mini family reunion in Charleston! On a Friends and Family vacation in May 2013, we had the opportunity to tour with Laura Wichmann Hipp. It was like opening a gift box filled with treasures of Charleston. The tour was a warm, intimate glimpse of Charleston history, with personal touches of our new friend, Laura. We heard stories, learned about native plants, and ate the most delicious food served with love. It was a fantastic experience, I highly recommend for anyone wanting to embrace the charms of Charleston. While on a family vacation on Isle of Palms three of us went in to Charleston to Laura Hipp’s tour of Charleston. It was absolutely fantastic. We felt like we had been with an old friend. I would do it again. I am a lawyer from Connecticut. My sister is a businesswoman from Rhode Island. My sister-in-law is a retired Ohio schoolteacher who has recently moved to South Carolina. On March 8, 2013, the three of us experienced the magic of Laura Wichmann Hipp’s Charleston Tea Party Private Tour. The houses were beautiful, the gardens were exquisite, the breakfast was a tribute to homemade biscuits and grits, and luncheon at Laura’s home was an homage to Southern hospitality and cuisine. To be sure, other tours feature beautiful houses, lovely gardens and good food. But other tours do NOT have Laura Hipp, a Charleston treasure. Laura loves, lives and embodies all that is wonderful about Charleston and the South. She is a soft-spoken gentlewoman possessed of a gracious manner and a sparkling wit. She is also a formidable historian with a wealth of knowledge and a natural gift for storytelling. Her command of American history and literature is so wide and so deep that she clearly and movingly conveys the tragedy, the spirit and the majesty of the South through her own research and experience as well as through effortless, spontaneous references to poets, diarists, novelists, biographers and other historians. I enthusiastically recommend the experience of Laura Wichmann Hipp’s Charleston Tea Party Private Tour to all those who appreciate and admire the beauty, cuisine, history, culture and utter charm of Charleston, South Carolina and of the American South. Laura made my day–November 13, 2012. In a “Personal Request Tour”, Laura picked me up at the King’s Courtyard Bed and Breakfast in old Charleston and piloted me to the fascinating Drayton Hall and grounds, and Magnolia Cemetery. This Magnolia Cemetery had been featured in a book talk at the Huntington Library in San Marino, CA by Drew Gilpin Faust (historian and currently the President at Harvard) in her book ‘This Republic of Suffering, Death and the American Civil War’. Laura was well acqainted with this cemetery, and the talk and silent mystery of all cemeteries was real in the cloudy afternoon. A highlight was paying respect to the new burials of the crew of the Hunley, a recent discovery of a Confederate submarine sunk and well-preserved in silt in the waters feeding into Charleston’s bay. Oyster stew, sandwiches, and cake followed at the Hipp home overlooking the Ashley River and the Coast Guard Installation. It was a great pleasure meeting Laura and experiencing Charleston through he eyes. Stu and I want to thank you for a wonderful behind the scenes tour of Charleston and the homes of your friends. We thoroughly enjoyed your tales of Charleston’s history and personal stories of people who lived in the city in past years. Breakfast in the Palmer Home and lunch in your lovely home made us feel like next door neighbors. We were pleasantly surprise by our after stop at City Hall! The rich mahogany furniture, beautiful portraits and chandeliers took us back in history. Thank you again and we will most definitely recommend you to our friends. I am reading through your website and all of the wonderful comments. In the words of George Bailey (Jimmy Stewart), I can only say, Laura Wichman Hipp, I am so glad that I know you. It’s been since grammar school in Charleston that you have been my friend. Though my life since college has kept me from Charleston, I still love you; you are a treasure. My wife and I have lived in the Charleston area for over 15 years. For years friends have been recommending us to go on a tour of Charleston through the guide and experience of Laura Wichmann Hipp. We finally made time to go, and we are so glad that we did. It was an incredible experience. We were able to see Charleston in a whole new way, and enjoyed inside views that we have never had the privilege to experience. What a rare opportunity it was to be in these beautiful private homes and gardens of Charleston. The breakfast and Tea were wonderful and greatly exceeded our expectations. Laura Wichmann Hipp is just as passionate about her city, Charleston, as she is with history. So between the food, the living history taught through the heart of Laura, and the spectacular views, we give it 5 stars. It truly is an exceptional value and incredible experience that all guests to Charleston and residents should experience. Janet, Mary, Liz, and I wish to thank you for a memorable experience of seeing Charleston through your eyes. The day was so beautiful with perfect weather and a sense we were part of Charleston. Starting the day with a delicious breakfast overlooking the Charleston Harbor and Ft. Sumter, followed by an intimate tour of homes and gardens, culminating in an elegant tea at your home, felt like we were stepping back in time to glimpse Charleston’s storied history and importance to our country. Laura, you are a treasure….a charming and enchanting goodwill Ambassador for your beloved City…..a truly gracious hostess and belle of Charleston. Thank you so much for sharing true and warm Southern Hospitality. Your tour is a “must do” for any visitor to Charleston. Liza and I needed to get away and we eventually decided on Charleston in October, 2011. My brother Jim loves Charleston and immediately reminded us that we had met Laura, her husband Preston and their three lovely daughters, Olivia, Victoria and Delia, two years ago as they traveled through Pennsylvania to the Philadelphia Airport. They had stopped at our home and three hours later were on their way home. If you are going to Charleston, you MUST take a Charleston Tea Party Private Tour. Yes, Jim had taken the tour with Laura and was adopted by the surrogate Hipp family after a number of visits to the Holy City. So, it was a done deal, when in Charleston, you participate in a Charleston Tea Party Tour hosted by Laura Wichmann Hipp. We arrived at our hotel and were presented with fresh flowers from Laura’s garden, a lovely note that invited us to their home that evening for appetizers and libations. We would determine that evening when we would be taking the tour. As Laura and Preston picked us up, it was learned that we would be going to Laura’s father’s home to watch him arrive with his wife and friends and assist with the tying down of his sailboat as the sun set. WELCOME TO CHARLESTON. about the tour which included breakfast at the Palmer House, private tour of a truly magnificent garden and the piece d’resistance, lunch at Laura’s home that truly summed up the warmth and hospitality of Charleston. Reading many of the positive comments, I realize that most spent only a day with Laura and fortunately, the night before leaving we were entertained by Laura and Preston at the Charleston Yacht Club and ended with a fine dining experience. Even those experiences were a guided tour of the warmth and hospitality of Laura Wichmann Hipp. Brian and Liza McCullough’s trip was a needed get away more than they realized. They created memories including my private tour that sustain Brian. Liza died suddenly this December after a short illness. She was the picture of life, youth, and beauty when here, vibrant within and without. Our sunset glow at the South Property of the Carolina Yacht Club stays with me in my mind’s eye as I picture Brian and Liza with my husband and me having drinks overlooking the harbor, the picture of contentment. This experience together and the subsequent loss of Liza says to me to LIVE LIFE while we have the health; do not squander the good days of mobility, means, and opportunity. Get up early, make the most of every day. Carpe Diem! Our day with Laura Wichmann Hipp was the highlight of a three week driving trip through the Old South. While researching places to go and things to do I came across Laura’s website (just as you have), and the more I read about her and her tour, the more I felt this was a ‘must do’. Usually my wife and I try to do our own thing and avoid the commercial tours where we pay way too much to be hussled around like cattle, whereas the idea of a small personal tour by a life long resident of Charleston just made sense. When I called Laura to reserve our tour, she asked if we had made lodging reservations yet; if not she would be happy to help. She said that to get the full flavor of Charleston, we should consider staying in the historic residential area. Even though I had already reserved a room in a downtown hotel, I followed her advice and researched several B and B’s in the Battery and decided on one of her recommendations, the Palmer Home, at 5 East Battery. What a perfect location! Right on the sea wall looking out on the bay towards Fort Sumter, something we would have missed out on if not for Laura. Wow, what a pleasant surprise when Laura met us at our B&B for our tour. Laura is a true Southern Lady. * We could just imagine her in a hoop skirt, with her broad rimmed hat as she glided along from place to place showing us the wonders of Charleston and telling us about it’s contribution to our country’s history. Like others have said in their comments, her knowledge of Charleston history is amazing, and our access to private homes and gardens was something that no other tour could give us. The crowning touch of our tour was being taken to her home and served a wonderful Tea prepared by her and Varnetta, her beloved “Help”. What fun, cracking fresh crab claws and telling stories of days gone by, something I had not done in fifty years since a youth with my grand mother, when she boiled crabs on an open fire in the galvanized wash tub in the back yard. Having visited Charleston on previous occasions, but never through a tour, my wife and I decided to book Laura Wichmann Hipp’s Charleston Tea Party Private Tour for Thursday, September 22, 2011. Understanding that buying something sight unseen can always be chancy, we were somewhat apprehensive as to what our experience might be. We couldn’t have more wrong in our apprehension. Laura’s tour was wonderful! It was, in fact, the highlight of our vacation. Laura’s knowledge of the present and past history of Charleston and the South in general is nothing short of amazing. Our tour began with a traditional full Southern breakfast in a gorgeous home on The Battery overlooking Fort Sumter. After breakfast, Laura guided our small group through the beautiful homes and gardens of the historic district. Throughout the tour, Laura regaled us with fascinating and intimate stories of Charleston and its most prominent citizens. Standing inside those wonderfully preserved homes and perfectly manicured gardens made us feel as if we had been transported back in time. But it should come as no surprise given Laura’s background. Being a lifetime resident of Charleston and having been educated at both Oxford and the College of Charleston, she epitomizes not only a scholarly approach to Charleston’s history, but a grace and charm so typical of the Old South. We enjoyed so many wonderful moments of the tour that time seemed to just fly by. Our day ended at Laura’s charming home with a lunch that she herself had prepared. We dined on a perfectly presented plate of gazpacho aspic encircled by locally caught shrimp. We sipped freshly brewed tea from elegant cups poured from her silver tea service with a dessert topped with flowers from Laura’s garden. At the end of the tour, we found ourselves wishing we could linger and listen to just a few more of Laura’s fascinating stories. We will most definitely book Laura’s tour again and encourage anyone who wants to have a memorable experience in Charleston to do the same. My mom and I had the best time on your tour…..lunch was just superb!!!! We also enjoyed getting to know you. I have recommended your tour to many folks and will take the tour again. Thanks sooooo much for such a special day for my mom and me to cherish. I chose your tour as a special gift to my wife. A personal tour of the homes and gardens of Charleston would give her a well deserved gem for a vacation memory. This she received without question. A wonderful surprise received for both of us was a truly warm welcome to the city and history of Charleston. It seemed every turn had a story, a moment to remember, a breathtaking vista. Your hospitality is unique, heart felt, and very appreciated. I will remember being swept into another era and for a morning not having the world and my work on my mind. I’ve been to Charleston many times, always looking for new adventures. I could tour the same home and garden each time but would always see something new (I never get enough). Your Charleston Tea Party PrivateTour took it to the highest level. I’ve always said, I would love to knock on the door of private Charleston homes and gardens where they would let me in. You made my dream come true! Ann, Ruby and I felt we were invited guests of your friends’ homes and gardens. You have a talent with words, knowledge of history, and the love of your home city of Charleston. As an academic at both the University of Cambridge in England and the Russian Academy of Art in St. Petersburg, I was extremely impressed by the tour of Charleston given by Laura Wichmann Hipp. An extremely learned lady on all aspects of Charlestonian, Carolinian, indeed Southern American history, culture and people, she provides extraordinary and fascinating information (as well as a delicious lunch and tea!) to accompany her tours. Lecturing on these subjects myself, I found that, in particular, she avoids the usual biases relating to southern history and the War which tore the American nation apart, costing well over 620,000 dead. She points out the richness of southern society over the centuries with its myriad of glorious facets, stressing the nobility of southern women and men who put honour, moral nobility and a sense of community above all else, one in which a Judeo-Christian belief informed and continues to inform. In this world of the American Deep South, Charleston was and remains its most beautiful and enchanting city, a feature which Laura Wichmann Hipp not only underscores but makes vibrant even to the most fleeting visitor! I am finally writing to say how much we all enjoyed our Tea Party Tour. We were with you several weeks ago on Tuesday, April 29th. We came to Charleston on a girl trip from Houston. I was with my sister, my mother, and my sister’s mother-in-law. Your tour was my favorite activity from our trip. I have been praying for your sweet mother and hope she is recovering quickly from her surgery. Thank you again for a lovely day! Bob and I had such a wonderful day with you. Your knowledge of Charleston and gracious spirit was just so beyond anything we could have imagined. The tour of the gardens and lunch in your beautiful home was such a treat. We have travelled to many places and had many great days on our trips, but the day spent with you stands out and will be one of our most treasured memories. We did go to the “Sounds of Charleston” at the Circular Congretional Church and just loved it. Thank you for telling us about it. We took a tour with you after having come into port on the Regatta on April 14th. 2011. The tour was delightful, it had such a personal touch. The tour of the homes and gardens we saw were so much better than we could have seen on a tour off of the ship. This was one of the highlights of our cruise.